July 2013: Had tires rotated by Goodyear. Usually I have this done at Honda but I wanted to take advantage of the free rotation service with tire purchase. 3 Days later: Wheel almost came off because of loose wheel nuts on driver front side. I had the rotation done on a Friday and drove about 200 miles over the weekend until Monday when it suddenly felt like I had a flat tire. Goodyear said the wheel wasn't mounted flush due to corrosion and that caused the nuts to loosen. They cleaned it up and said it was fixed. I took the car to Honda to check for damage just in case. No problems found. October 2013: Took the car in for a major service. I was told to replace both control arms (which I did). Also replaced drive belt. They said I would need front brakes in a few months but no other problems were reported. My questions: Is this a rare problem? 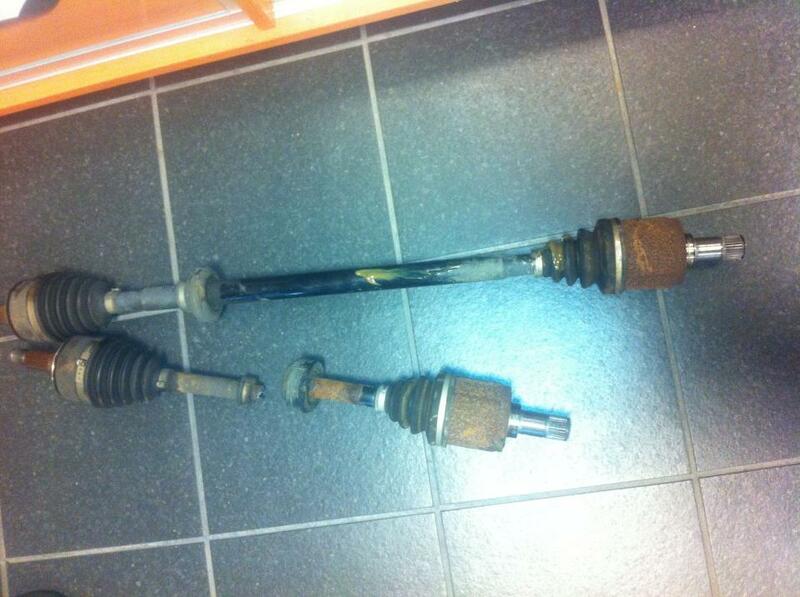 They told me I only needed to replace the broken axle but I asked them to replace both (the paranoia will kill me). It scares me that this could happen when I'm so meticulous about keeping my car serviced and safe. 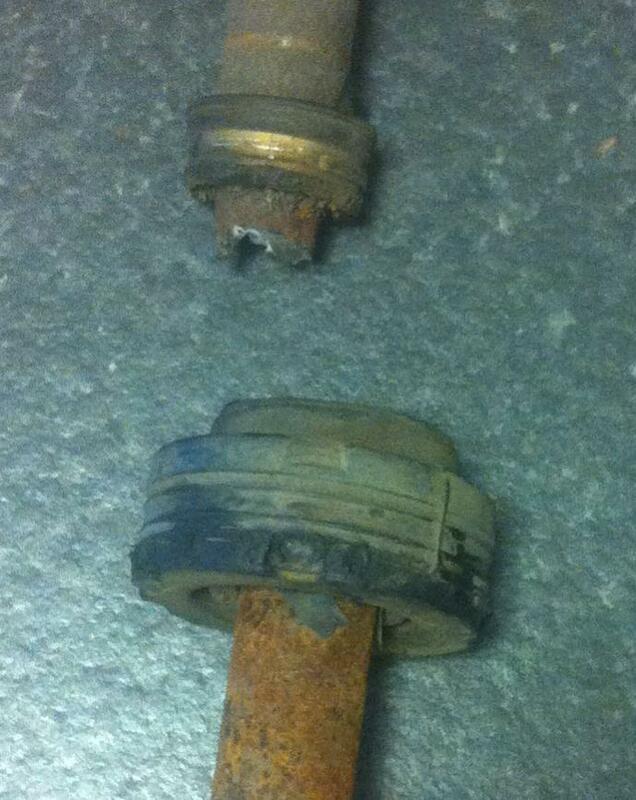 Also, is there any way the previous wheel issue and control arm repair could have lead to this happening? Usually it is the ball joint that breaks especially if the rubber boot has been damaged and dirt/water got in there. You would know for you would have noticed shaking and bouncing when you drove. It is possible for a control arm to break, but unusual for they are cast steel. Ever been in an accident? No accident that I know of. Bought the car at 60k miles (Honda Certified and clean carfax). No bouncing or shaking either and I am very sensitive to those symptoms. I had both control arms/joints replaced less than a month ago. I asked them to save the part so that I can take a picture when I pick the car up later. Sorry to hear about the broken axle. I know that in NY, and most likely in Mass, potholes kill tires and axles. My uncles Accord seemed fine after he bottomed out in a pothole and a couple of days later his axle gave out in my drive way. At least they are easy to replace, but it is starting to get cold. Good luck! Thank you. I just got the car back. Attaching pics of the axles in case anyone is interested. I had both replaced as a precaution (I would be so paranoid if I hadn't). There is a lot of corrosion present - probably due to my location. Corrosion combined w/ slight shaft imbalance leads to corrosion-accelerated fatigue. Once a deep pit forms, a crack is likely, eventually leading to failure. The balance ring may have exacerbated the problem by holding salty water on the defect. Annual doses of corrosion-inhibitor (LPS or similar) may mitigate this in future. I believe there are places that offer this service, but no experience as corrosion is not a problem in S TX. Thanks. The tech did say that the ring held water in there and probably made things worse but that the replacement part will not have that problem. I wonder if there should be a recommendation to replace these parts every so often if you live in a snow belt. Corision prevention is a good idea. If you are worried, you can go to Lowes, Home Depot or any hardware store and buy yourself a bottle of this stuff. It comes in a fairly small bottle and you purchase a very cheap brush because you will throw it away afterwards. The stuff is glossy usually white paint that penetrates the rust to stop further erosion. The white paints drys fast to a black/dark gray color. I have never used it for this purpose, but I can testify is that it works extremely well. Keep it off rubber parts and any movable places. Hey, I just looked at your photos and I am surprised the broken had no paint left on it ad the other one did. Did these two come from the same car? That is odd and makes me again wonder if your car was in an accident and the other axle was replaced. There may be other reasons why one may have been replaced too. A little crack that begins with some corrosion, will grow across the thickness of the axle over time. Might take weeks, during which time you might feel vibrations. When it gets to the point where the remaining connected metal is small enough, it breaks. It might have started with a notch from being hit by something? Gouge through the paint with pliers or vise-grips? Who knows?? Seems like Goodyear wouldn't have any reason to mess with the axle that far inboard so I don't really see any way to blame them. Every fall you could get under the car & look for stuff. Spray rust-proofing goop and/or paint where needed. And just be emotionally prepared for the rest of the car to corrode also. I'm in northeast Ohio where the roads are white from salt, not from snow. Quick Reply: What would cause an axle to snap?